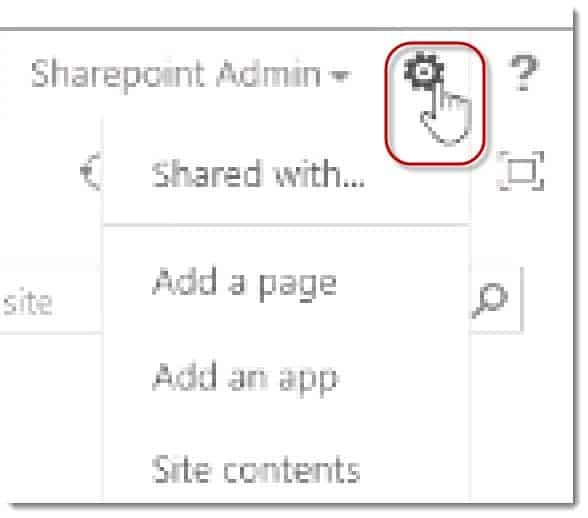 In this SharePoint training video, I want to talk about the Navigation Controls in SharePoint. 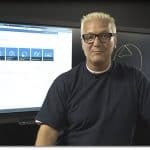 They tend to fall into two kind of different categories; one with the navigation controls in a typical Collaboration Site such as a Team Site or a Project Site. 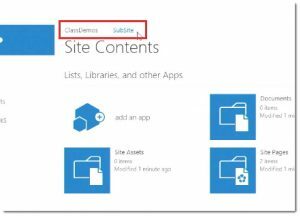 These are Sites that are based on the Team Site Template or the Project Site Template. There are several other collaboration Site templates as well but we’ll focus on one on the Team Site Template you will be able to take that knowledge and apply it any Site that’s based on what we call the Collaboration Category. 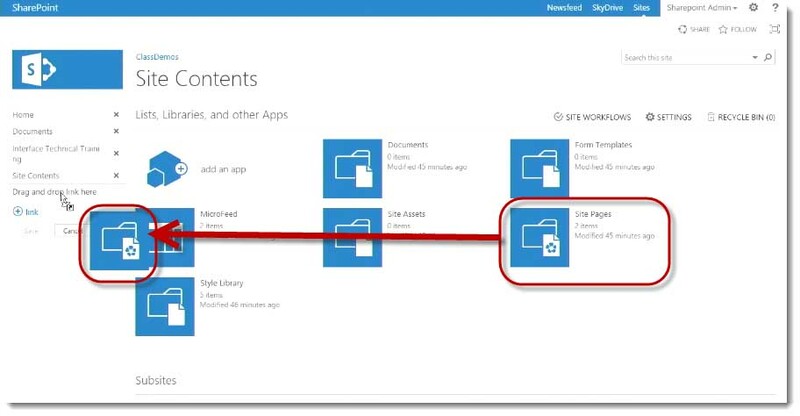 The second example are Sites which really use something called the Publishing Feature and there’s a set of templates that use the Publishing Feature have it involved in the navigation options change a little bit in the terminology changes a bit so will keep the publishing Site navigation in another video. 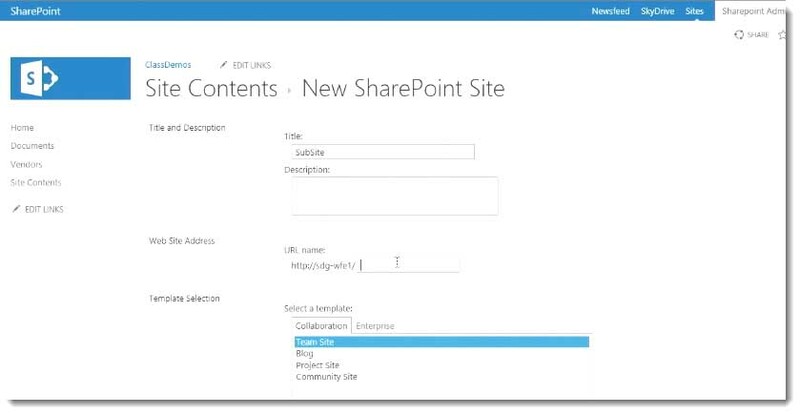 This video is about Navigation in a SharePoint Collaboration Site. I have my Site Collection here drawing a diagram first and I chose as the top level Site template that out-of-the-box template Site template meaning one in the SharePoint to my farm administrator which is me of course and said “hey can you give me a new Site Collection and base the top level Site on the Team Site Template that was executed by SharePoint and then I have this to start with so that’s what I mean by “out-of-the-box”. 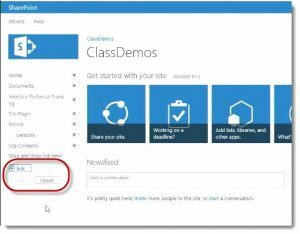 I named the Site “Site class demo Site”. 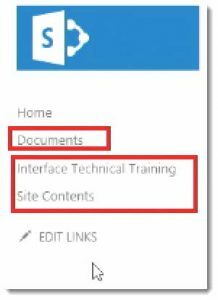 It’s a Team Site Template in the main navigation controls really fall in these areas. This area here when you’re talking about the collaboration Site you and SharePoint will refer to this as a Quick Launch Bar. 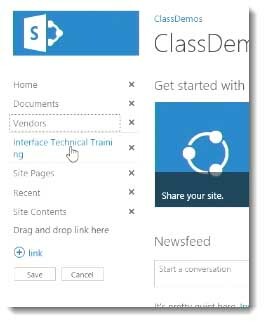 The Quick Launch Bar typically, like all the navigation controls in SharePoint, can be configured to have links that take you somewhere and you can configure those links and take you anywhere in the internet. 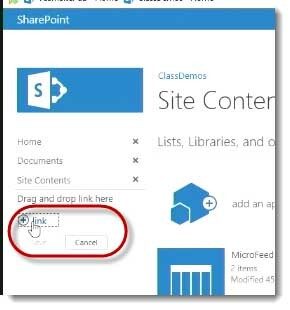 But the main idea or that out of a box implementation, the way SharePoint tends to work is those links and point to things that are in the in that SharePoint Site so they can point to things that you might find if you were to go to that Site and click this icon test link. If you click the Site Contents link. You’re going to see a display or a view of all of the different Lists and Library Apps that are in this Site. 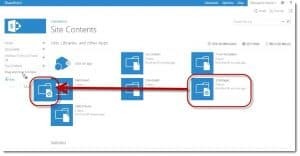 Typically, if you add a List or Library App to this area you’re adding into that Site and generally it will appear in the Quick Launch Bar or the Quick Launch set of links. 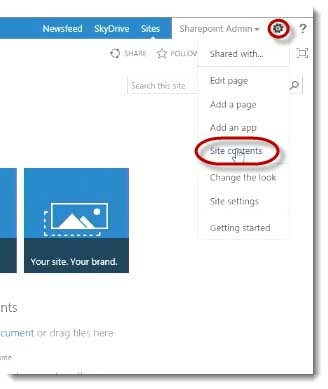 This is not always the case, you can go in either through the App Settings or by editing the Quick Launch Bar or through the Sites Settings Page and change what appears on the quick launch bar. 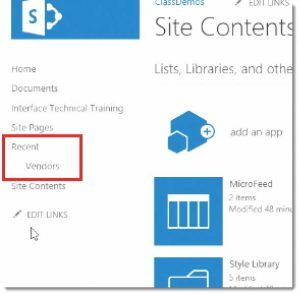 Most the time as you add Apps and List and Libraries to your Site then they will appear in the Quick Launch Bar. This logo is usually one of the first things people who want to brand or customize the way SharePoint looks will change that logo for company logo but whatever image they put in there that will take you to the homepage of the Site that you’re on. So the Quick Launch Bar again is over here on the left side. That logo appears up in the upper left hand corner and then that Site Contents link you’ll see here. If you want to see which Lists or Library Apps are in this Site you can click that if you have the right permissions and you have the correct permissions to access everything in that Site which you would if you’re the Site Collection Administer, you’ll see everything that’s visible through the browser here. 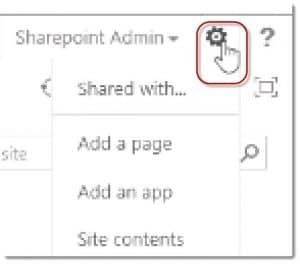 Now as the case in SharePoint, there actually are a few ways to get to that Site Contents page if I’m a Site-collection administrator I can come up and click on this gear icon. 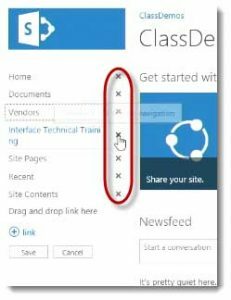 That gear icon traditionally appeared in previous versions of SharePoint as the Site Actions Menu so I still called the Site Actions Gear. 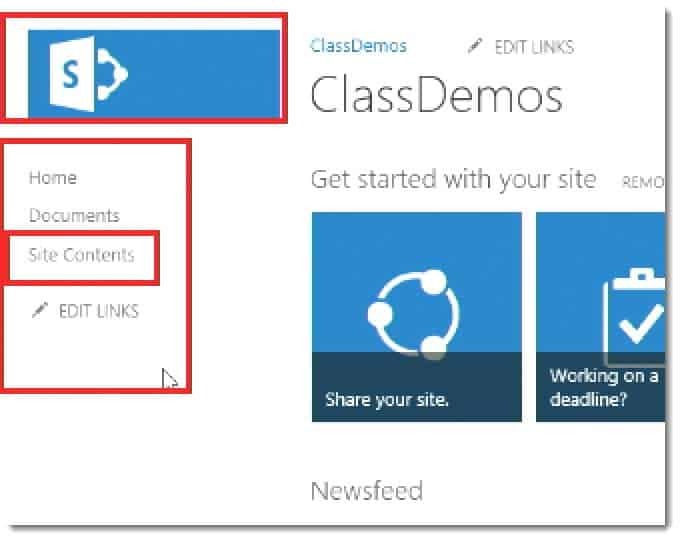 If you click that year depending on your permissions you’ll get a set of actions you’ll get a set of links that do something. One of those is a Site content so if I click that, it’s taking me to the same place as this Site Contents over here in the Quick Launch Bar. This is actually the same page so a few ways to get there. 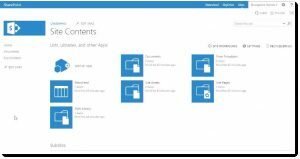 The Quick Launch Bar again tends to show you things in this Site that that’s what people are used to because that’s what the out-of-the-box SharePoint experience does in most cases. 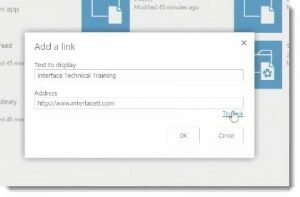 I can add a link right there to Interface Technical Training I can just click edit links. 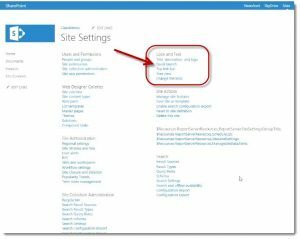 You may also like: What is Navigation in a Publishing Site? As you can see when I’m done and I click save that is one way to actually add a link to the Quick Launch Bar. You can click and it links and you can click Add links and put in whatever you want you’re not limited to linking things inside a SharePoint. You may notice here that on the left Site there’s not a 100%. 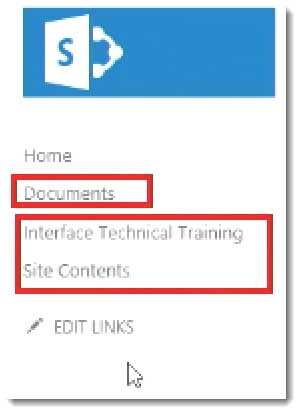 I have a link to documents, a link to interface technical training and a link to on Site Contents and home. 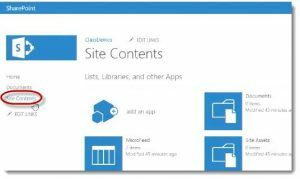 I don’t’ have a link to Site Assets library. 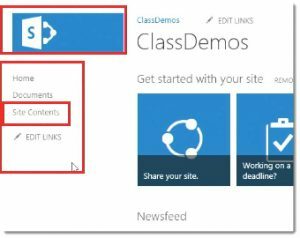 What I can do is I can click edit links and I can grab it with my Site Contents page and I can drop it where it says drag and drop links here. 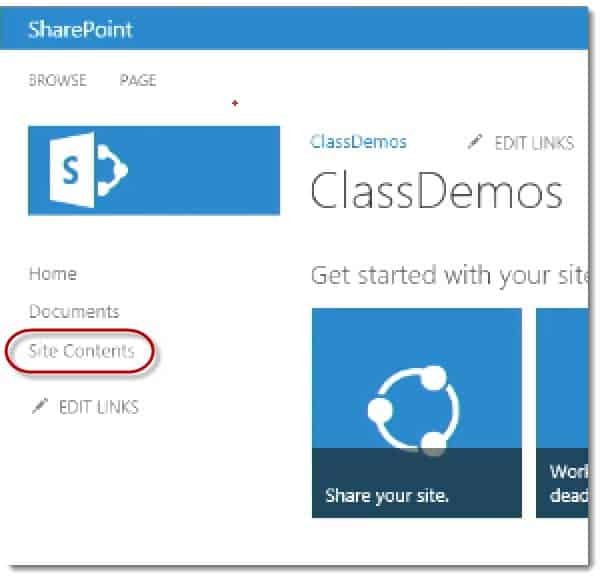 Now I’ve actually added something that way that’s another way to the edit links in the Quick Launch Bar I can hand at it than I can drag and drop them from somewhere in SharePoint over to the Quick Launch Bar. I can actually create new App so I’ll click Add an App. 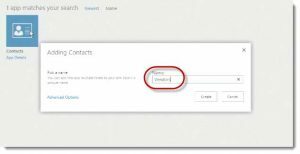 I’ll add a new contacts list so just like Sites are based on templates, Lists and Libraries are based on templates. They give us of a bunch of templates out-of-the-box in SharePoint. 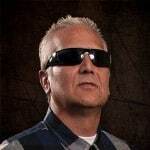 In fact I’m type in the word contacts here because I know that name and I give me a new App, or a new list of contacts people’s first name last name email address etc. and I’ll call it Vendors. I’m creating a list of vendors who are contacts so I’ve based it on the contacts list template and when I go ahead and look at the Quick Launch Bar as I’d added that you can see that added a subheading named Recent and it added my Vendor list to the Quick Launch Bar. That’s what I meant when I said that users are very familiar with the idea that things in the Quick Launch Bar tend to point to things in that Site but I’ve shown you that’s not something you’re restricted to. You can add links anywhere you like. Now I click edit links again. I can also rearrange these links they made this awesome in SharePoint 2013. 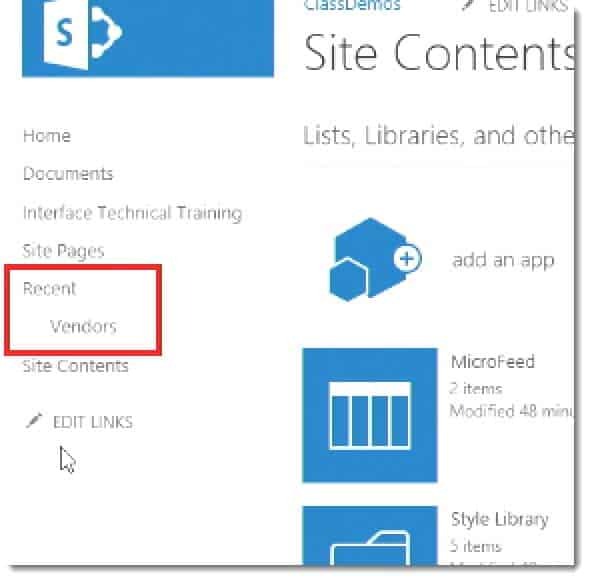 Now I can mouse and hold down that vendors list and I can drag it up under documents. I’ll drag it a little more to the left so it’s on the same appearance of the hierarchical level as documents and I can actually delete links by clicking the “X”. 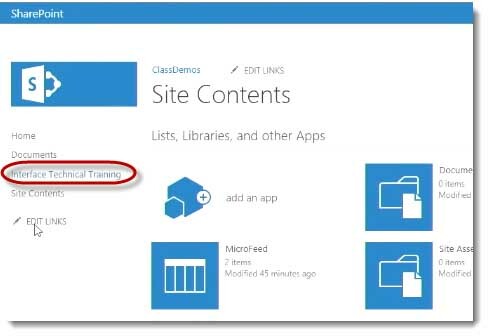 I can get rid of Interface Technical Training and Site pages and get rid of a recent. I’m just going to adjust my Quick Launch however I like whatever I want that appears to be. 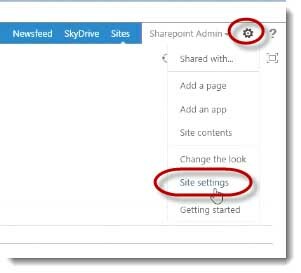 Another way to edit the Quick Launch Bar in a Collaboration Site is to go the traditional route which his Site actions > Site settings. 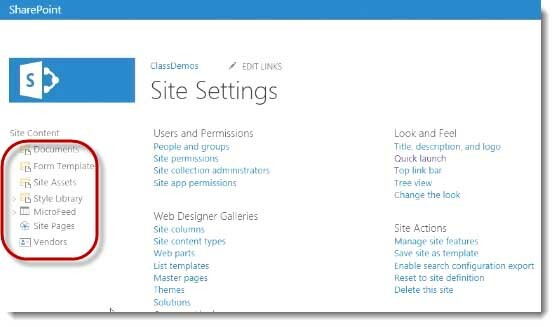 If your Site Collection administrator or Site owner you’re going to Site actions > Site settings or list > lists settings or library > library setting quite a bit. If I come over here under look and feel on the Site settings page. You’ll see that the Quick Launch Bar has its own link right there so I can click Quick Launch and then what I’ll get is it feels like an old school way to edit the links but you can change the order. 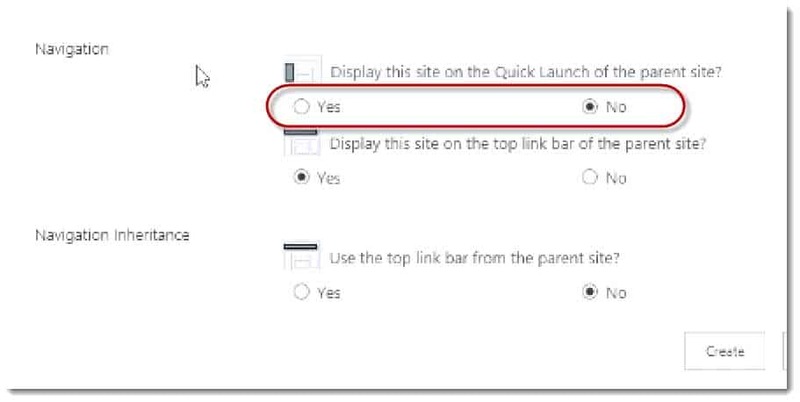 You can add a new link which is very similar to what you do through the browser on the other side where we said “get a new link” and it gave us a little form. 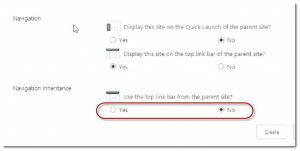 You can even a new heading to your link so there’s a couple things that you can do editing the Quick Launch Bar in this way as well. Now if I come over here to Site actions > Site settings there’s one more option that I have in the Quick Launch Bar and that is this thing called “Tree view”. This gives a little bit more of a hierarchal appearance and you can enable the Quick Launch Bar and enable the Tree View. You can disable the Quick Launch Bar and just enable the Tree View. Or you can uncheck both of those and now you essentially got rid of the Quick Launch Bar and the Tree View. I’m going to go back and click the Tree View and I’m going to enable tree view. When I do that you should see that the hierarchy here looks like what we typically get what we think of something like content and structure. We talked about that is two different main types navigation one is Collaboration Sites like a Team Site like this one and another one is Publishing Sites. 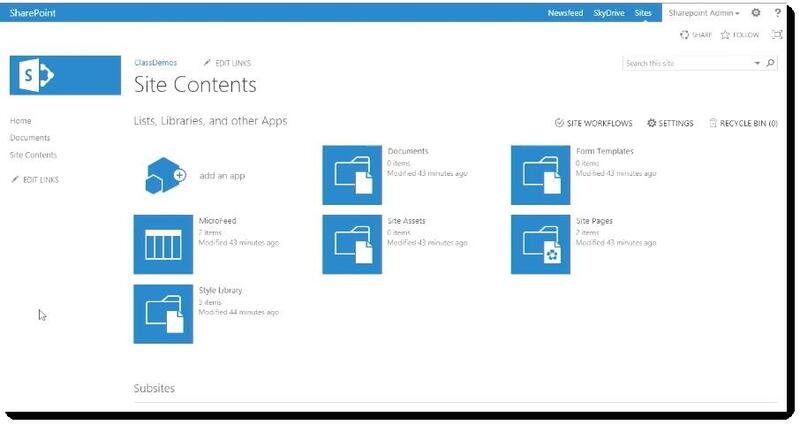 The Publishing Site gives us this thing called a Content and Structure Reports and here we see that we can navigate the hierarchy with these little fly out menus and if we have sub-folders in or lists and libraries. So this can be something that you may want to turn on and some people like this I tend to prefer a little bit more of a traditional one – that’s just my personal preference. 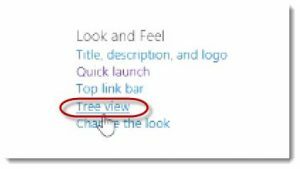 So I’ll turn that back to the original which is Quick Launch and I will not enabled tree view by unchecking it and enable Quick Launch. Finally there are two other controls one of them is this Top Links Bar. We call this the Top Links Bar in the Collaboration Site and the other one is this bread-crumb trail. Now the Top Links Bar tends to point to things not on the Site. 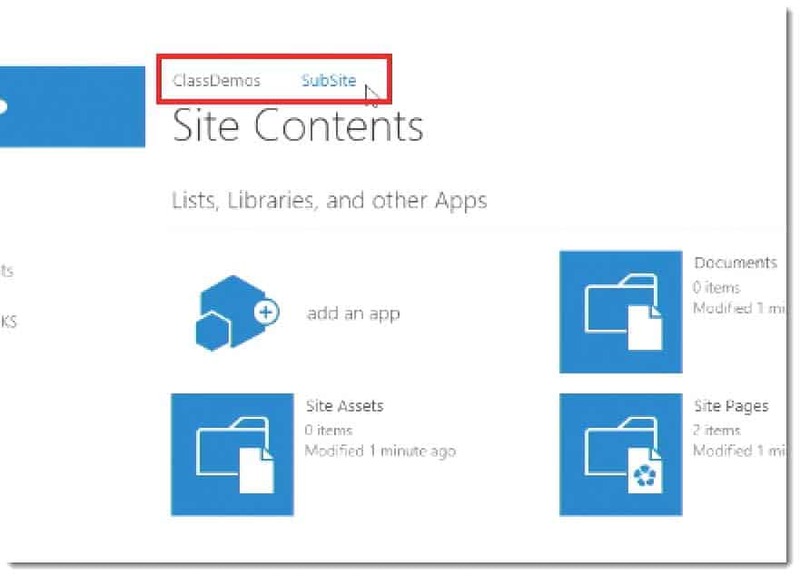 Although it says class demos and by the way that’s the name of Site if I were to create a sub-Site which I will do now by doing Site actions > Site content. 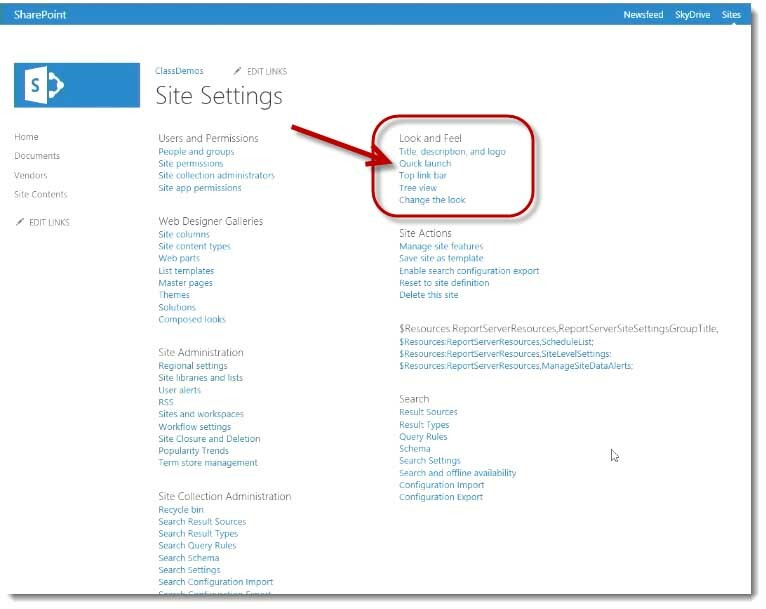 Then I’ll scroll down at the very bottom of the Site Contents page is a new subSite. So I’m adding to the hierarchy of my Site Collection so I started with this team Site here and I went to Site actions > Sites Content and I chose new subSite and it’s going to put that new subSite just below the top level Site and I’m going to choose the template to base that subSite on and then I’m going to make a decision as far as navigation of “do I want to use the same top-links bar as the parents?” which will give a nice consistent navigation throughout the Site Collection or do I want to start over essentially with the new navigation control in the top link bar and starts here? Also I’m going to have some options relating to the Quick Launch Bar. Then you can see the where it put this one layer down. 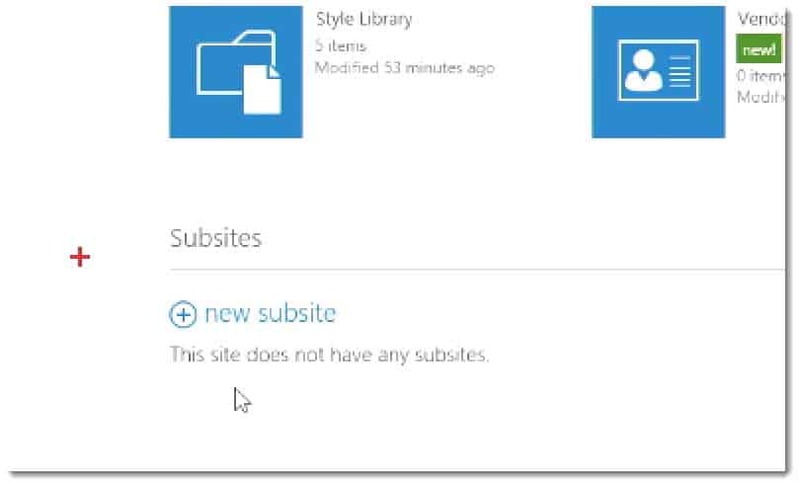 So if someone in this environment typed in the address to get to the top level Sites of that Site Collection and then I get my option of choosing which can option to base this subSite on. 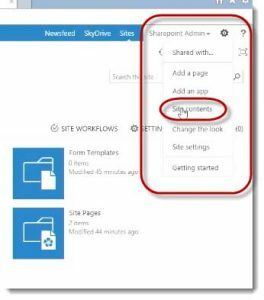 I will keep it as a team Site and down here and will leave the default as far as permissions but here’s my section about navigation. 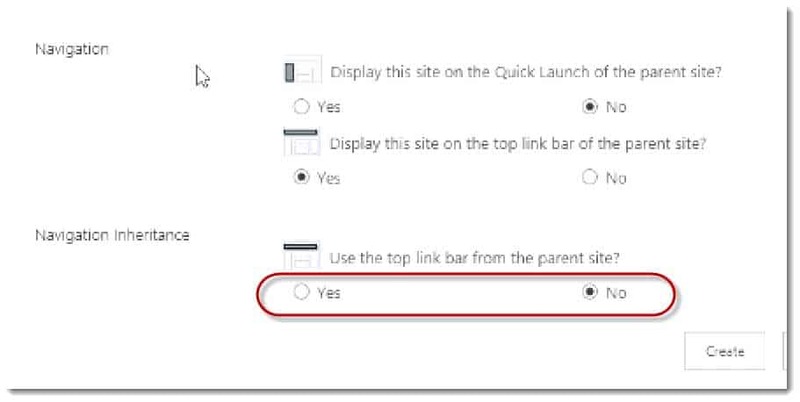 Now if I click yes and change the radio button here from no to yes then I’m going to get the quick launch from the parents Site and that would be a little bit unusual in most cases for users so the default is no. 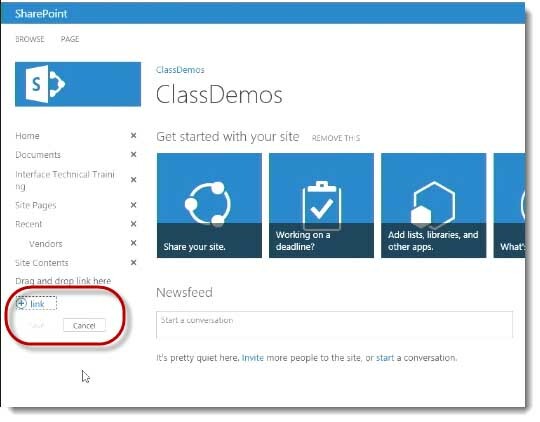 Each Site its own quick launch, that’s what users are probably going to expect. 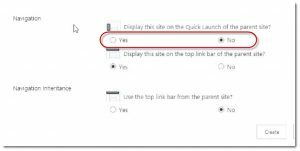 Then I have this option here which is set to yes “do I want to display this Site on the top link bar of the parent Site? That most-likely is yes that way people can see this Site from the top link bar of the parent Site. 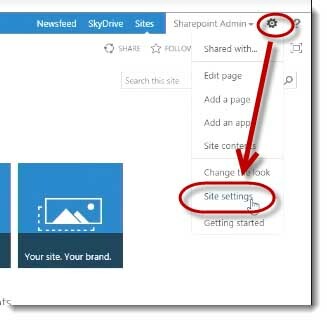 The Navigation Inheritance default is set to “no don’t use top link from the parent Site” which means this Site’s top link bar would have itself as the first thing on the left which will see moment but I’m going to change that to yet to have a consistent look and feel. When I click create here by making those decisions in a collaboration Site on the top link bar now I’m using the top link bar from the parent and I’m showing my Site in that top link bar so you see with that does on the top link of the parent, class demos is here if I click that Class Demos link I’m taken up one level but my Site’s subSite appears here. Had I chosen not to inherit this from the parent when I went to the sub-Site then this sub-Site would be over on the left side. So it’s really up to you if you want that consistent look and feel I’d tend to find my users do like that when they’re in the Site Collection. 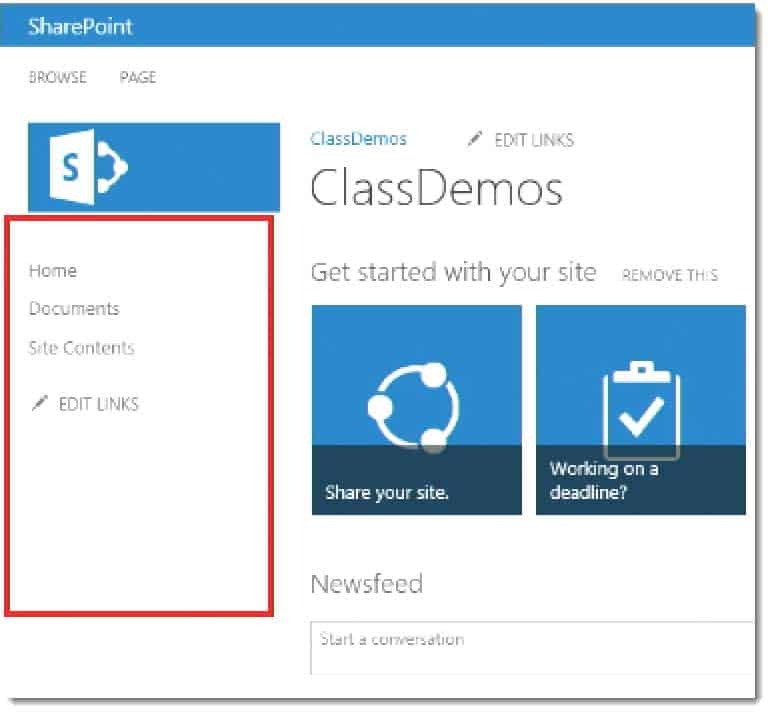 So that is the Navigation Controls we got the Quick Launch we got you can set the Tree View control you can edit the links using the in-line editing and you can click the Site Contents link to see all the different lists and library apps that are available in this particular Site as you add apps to SharePoint they tend to appear on the quick launch within that Site when you create a sub-Site you have many choices relating to the top link bar which you see here. The Top Link Bar is really meant to point to things not on your Site in most cases other than is usually a link to the Site itself. 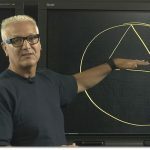 You can connect this to go through out the hierarchy, that’s up to you. You’ve got the logo that will take you back to the homepage of the Site you’re on. 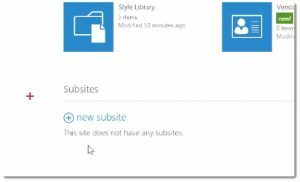 If I know this I can click on the subSite down one level if I click on its logo it takes me to homepage. 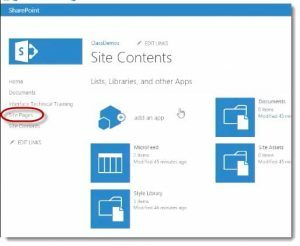 I got the Site Actions gear over here where I can get to the Site Settings page to configure things in Site and Site Collection in the Site Contents page. Which shows me the List and Libraries App. 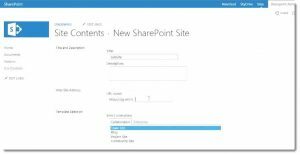 That covers the SharePoint Navigation Controls within the context of a Collaboration Site when not using the Publishing Feature.